I’m always talking the talk about over-produced records and how something lofi is usually ultimately more satisfying. Well today we walk the walk with the new record from Trailer Star aka Shaun Belcher. This arrived unannounced in my inbox by way of England. Shaun Belcher is a singer songwriter along the lines of our own Jim White. That means he’s concerned with sin and salvation and creates folk music that has a southern gothic feel to it. 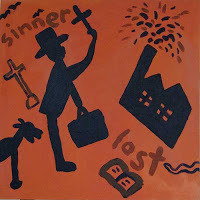 To go along with the music Shaun creates original artwork that is clearly influenced by the folk art of the deep south. Here’s his song “Firework Factory” and the artwork that goes with it.Suit of Nettles is the new record and the limited edition cd can be purchased from the trailerstar records website.